Here are a few more words I picked up from our travels in Hokkaido last month and from my followup reading in Ann Irish's book Hokkaido (McFarland, 2009). 道産子 Dosanko '(Hokkai)do-born-child' – Originally applied to a particular breed of horse, the Hokkaido Pony (北海道和種 Hokkaidō washu), this term now applies to anyone or anything from Hokkaido: from prefecture-marketing antenna shops to cooking styles to streetcar types. It has become the prefecture's brand name. 毬藻 marimo 'ball seaweed' (Aegagropila linnaei) – We first saw marimo on display in a small aquarium by the souvenir shops in JR Kushiro train station. They are a species of filamentous green algae (Chlorophyta) that forms large and velvety green balls. Colonies of such balls are only known to form in lakes in Iceland, Scotland, Estonia, and in Japan, where they are one of the many attractions of Lake Akan in Kushiro. The Japanese botanist Kawakami Tatsuhiko (川上龍彦) gave it the name marimo in 1898. Ainu names for it include torasampe ('lake goblin') and tokarip ('lake roller'). English names for it include Cladophora balls, Lake balls, or Moss balls. Marimo also gave rise to a whole range of mascot merchandise under the name Marimokkori. ペチカ pechika 'Russian stove' – It was in Hokkaido that I learned that Japanese ikura 'salmon roe' was borrowed from Russian икра (ikra), and in Irish's book I learned of another Japanese borrowing from Russian, pechika 'Russian stove' from печка (pechka), the diminutive of (Русская) печь '(Russian) oven/stove'. The Japanese who settled Hokkaido adapted some Russian techniques to deal with the harsh northern winters, including horse-drawn sleighs with curved runners and stoves that radiated heat more effectively than the open fireplaces that were standard in traditional Japanese living/dining rooms. Those settlers included not just migrants from Honshu during Meiji times, but also refugees from Sakhalin, the Kuriles, and Manchuria after World War II ended. My impression is that Japanese pechika refers not to the large Russian ovens of clay, brick, or tile, but to smaller iron stoves, like the one in this Japanese fisherman's workroom. Irish (p. 285) mentions "the Japanese song Pechika, which describes a family telling stories around a stove." Traditional Japanese practices of government and administration were not suited to an enterprise such as pioneer settlement. Allowing freedom and adaptability rather than following set regulations—which might not fit the conditions—was not the Japanese way. Japan had no tradition of democracy. Moreover, with some Kaitakushi officials in Tokyo and others in Sapporo and the slowness of communication at the time, administration was bound to be difficult. In 1874, the Kaitakushi [Development Commission] gained official permission to recruit ex-samurai to go to the northern island as tondenhei [屯田兵 'camp-field-soldier'], or farmer-soldiers. These former samurai whose feudal lords had not supported the Meiji Restoration now had no means of making a living; their lords encouraged emigration to Hokkaido. As early as 1854, several shogunate inspectors in Hokkaido had recommended a tondenhei system; perhaps the Russian policy of setting up Cossack outposts in Siberia inspired the scheme. The first such Hokkaido settlement appeared in 1875, when 198 farmer-soldiers and their families came to Sapporo and established homes in the Kotoni district, northwest of today's city center. The government furnished each former samurai with eight acres of land and a house complete with a Russian stove to cope with the winter cold. The men even received cold weather uniforms. In return, the eighteen to thirty-five year old male settlers were placed in regiments and participated in military exercises (mostly in the winter, when farming tasks did not claim their immediate attention). They would turn out for military duty if needed. Thus they could help protect Hokkaido from the Russians. They carried guns and, as former samurai, swords. By the end of 1876, more than two thousand tondenhei soldier-farmers had gone to Hokkaido in the program, many simply because the Meiji Restoration had deprived them of their livelihood. Though at first only former samurai were included, later the scheme was opened to others. After the 1875 treaty settled the border with Russia, the military justification no longer seemed so important, and few more tondenhei were recruited. In 1903 they were incorporated into the nation's army. During the years of recruitment, over seven thousand tondenhei families participated in establishing about forty villages in Hokkaido. One very small tondenhei settlement near Sapporo only had thirty-two households, but almost all the others held between 150 and 220 families. Most of these villages were placed in the Ishikari Valley, around Sapporo and Takikawa and upstream in the Kamikawa basin, in which Asahikawa sits. A few tondenhei villages were along the coast, at Muroran and near Akkeshi and Nemuro far to the east. The eastern settlements, established from 1886 to about 1890, were planned as defense posts because Russian encroachment via the Kuril Islands seemed a possibility despite the border treaty adopted in 1875 by Japan and Russia. Three tondenhei villages were placed upstream on the Tokoro River and two on the Yubetsu, both streams emptying into the Sea of Okhotsk on Hokkaido's northeast coast. The most prosperous area of tondenhei settlement, though, was in the Kamikawa basin [incl. Biei and Furano above Asahikawa]. Here the settlers found fertile soild and a climate suitable for farming, with hot summer weather. The tondenhei settlers cultivated northern crops, but as hardy strains of rice later became available, farmers shifted more and more of the land to rice cultivation, which dominated the area by the early twentieth century. The tondenhei lived a regulated life, for example working a twelve hour day in the fields from April to September. During the colder part of the year, the workday would last for only eleven hours, men either clearing land or participating in military drill. Many of the tondenhei had a hard time, as they were not used to farming. But families did work together—each family recruited had to include two able-bodied members who could work in addition to the farmer-soldier—and lend a hand to each other. Some of the tondenhei served in the Russo-Japanese War. Tondenhei settlements were more successful than other new communities in Hokkaido. The Kaitakushi set aside good land for the tondenhei villages, which also received other special benefits. Moreover, as former samurai, the farmer-soldiers were often people who could exert leadership or influence farmers who did not have such advantages. Some years later, tondenhei military units became the famed and respected Seventh Division in the Army of Japan. 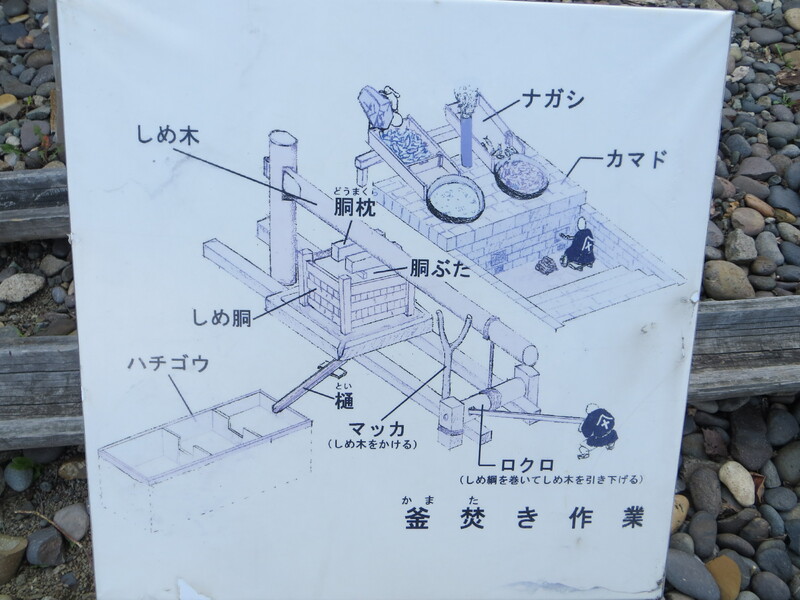 The Historical Village of Hokkaido in Sapporo had a sign showing a fish press used by Hokkaido herring fishermen to turn their (once) bounteous catches into fertilizer for farms throughout Honshu, where it was highly valued. To make the sign easier for Japanese schoolchildren to read, many words are written in kana rather than kanji, and furigana provide readings for some of the remaining kanji. Here is some of the vocabulary from that sign, starting with the title on the bottom right, then working from the top right down to the bottom left. If anyone has better glosses for these terms, I'd be happy to hear them. Many, many Hokkaido cities and towns, and even some on Honshu, have names derived from Ainu. "Sapporo" comes from an ancient Ainu name for the river there, either from sat poro pet, which would mean "big dry river" or sari poro pet, a reedy area by the river. The name of Wakkanai evolved from the Ainu term "yam wakkanay," meaning cold water river." Some people have thought that even Mt. Fuji's name comes from an Ainu word, fuchi, the Ainu fire goddess, but linguists today generally dismiss this idea. Shiraoi, a town on the coast between Muroran and Tomakomai, has long included a sizable Ainu community and now features an Ainu village for tourists. In Ainu, the town's name may have meant "place with many horseflies." John Batchelor wrote that it meant "the place where the tide comes out (over the land)," signifying high tides. When place names like this have been adapted into Japanese, they have been given written characters that fit their pronunciation. Shira [白] can mean "white" in Japanese and oi [老い] can mean "old age." The two characters with these meanings and pronunciations are written today to indicate the town name "Shiraoi." Near Shiraoi is the hot springs resort city of Noboribetsu. Nobori means "to ascend" or "to climb" in Japanese, and betsu is "special" or "different." The Ainu name, pronounced in a somewhat similar way, meant merely "turbid river." In this case, both Ainu and Japanese names are appropriate, for there are mountains in this town located along a river. Betsu, by the way, appears in many Hokkaido place names to represent the Ainu word pet, which means "river." The Ainu counting system differs from the Japanese, the number twenty playing a prominent role. The numbers one to five have their own names, as does ten. Six through nine are expressed as ten minus a number and the teens are expressed by numbers added to ten. Larger numbers are expressed as multiples of twenty, subtracting any amounts needed. A new British Consulate opened for business in 1863, and Richard Eusden assumed consular duties in 1867, serving here until 1880. He was by far the most effective British consul in Hakodate. Both he and his wife became involved in the community; she helped create the city's public garden. Over the years several fires damaged the consulate and it burned down in 1907. A few years later, the British government's Shanghai Construction Bureau built a new consulate, a two-story-high tile-roofed structure on a site a few blocks away. This building still exists, looking rather like a large bungalow transplanted to Asia. 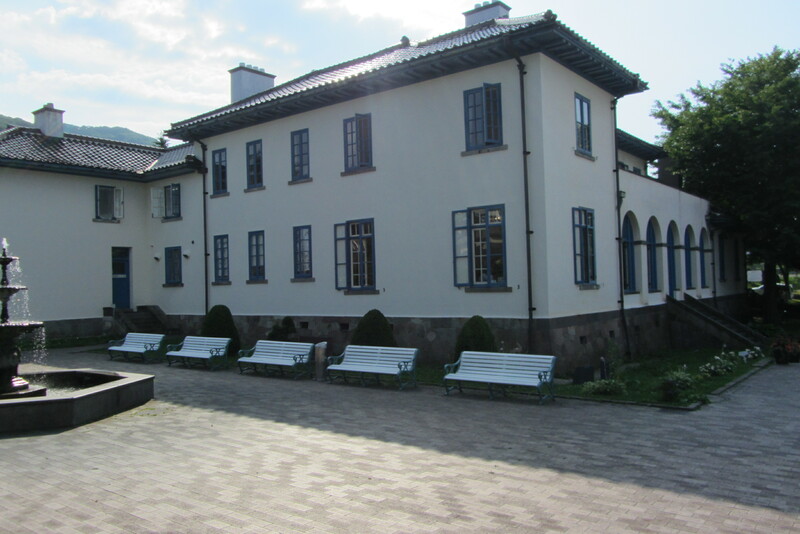 Nowadays it is open to tourists, featuring interesting historical exhibits about early western experiences in Hakodate, an English tea room and a souvenir shop carrying articles from Britain. The British ceased consular operations in Hakodate in 1934. The foreign consuls in Hakodate acted as judicial officials. When an American, Charles H. Smith, was charged in the death of a Japanese, the American, English and Russian consuls, the Hakodate bugyo and other Japanese and western men sat at the court and agreed that the defendant was not guilty, for he had shot in the darkness at a burglar. Hakodate at different times had consulates representing not only Russia, the United States and Great Britain, but also France, the Netherlands, Portugal, Germany, Switzerland, Denmark, Italy, Austria, Hungary and Spain, though these other nations were mostly represented by men who were consuls of other countries. Even Hawaii, when it was an independent nation, briefly had consular representation in Hokkaido. The foreigners perceived Hakodate as a safe, if sleepy place; they did not feel the need for weapons in Hakodate. "We do not go armed as all foreigners do in Yedo, wrote E. E. Rice and, while Yokohama had a specific area set aside for foreign settlement, Hakodate featured no special area for foreigners, though the various consulates were not far from each other. Labels: Britain, Europe, Japan, Russia, U.S.
During our Japan Rail Pass travels in Hokkaido last month, we encountered not just hordes of Chinese tourists (mostly from Taiwan) inside the trains, but also hordes of two kinds of large, green, weedy plants in the scenery that passed by our train windows. Wooded areas were often full of plants we recognized from our past travels as fuki 'butterbur', while more open areas were often infested with what seemed to be a giant, atomic mutant variety of carrot or Queen Anne's lace. We didn't find out what the latter was until we saw a sign identifying it at Cape Nosappu, at Hokkaido's (and Japan's) easternmost point. Fuki (フキ, also written 蕗、苳、款冬、菜蕗) 'giant butterbur, bog rhubarb'– Petasites japonicus is quite edible after removing some of its astringency. It makes a variety of side dishes to go with rice in both Japan and Korea. (However, too much of it eaten over long periods might damage the liver.) We had encountered it in 2012 at Hikone Castle, where a smaller variety was labeled tsuwabuki, and also at Akita Castle grounds, where we also found butterbur designs on a manhole cover. 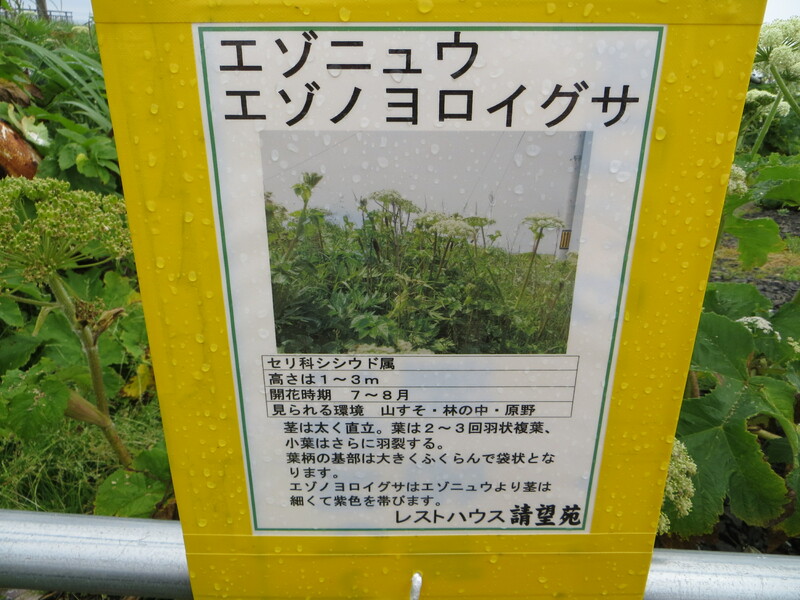 Shishiudo (シシウド, also called アンゼリカ anzerika) 'angelica' – Angelica is indeed a genus within the family Apiaceae (or Umbelliferae), which includes carrots, Queen Anne's lace, and many other plants, so my impressions of its taxonomic status were at least in the ballpark. However, the Japanese generic name suggests that Angelica is a type of udo 'Japanese spikenard, mountain asparagas' (Aralia cordata), in the closely related Araliaceae family, which includes ivy. Indeed, before I found out its name, I thought of it as udo no taiboku 'great tree of udo' (implying something useless, of large size but no strength, like 'all hat, no cattle' in American, or at least Texan, English). As the Japanese name of the latter suggests, both species seem closely related to the yoroigusa (Angelica dahurica) that grows elsewhere. According to Wikipedia, Angelica dahurica is a wildly grown species of angelica native to Siberia, Russia Far East, Mongolia, Northeastern China, Japan, Korea, and Taiwan. It tends to grow near river banks, along streams and among rocky shrubs. The root of the plant is widely used for its medicinal properties and is known to contain furanocoumarins and angelicotoxin. It is also commonly known as Chinese Angelica, Garden Angelica, Root of the Holy Ghost, and Wild Angelica, as well as its Chinese name, Bai Zhi (白芷).